During the decades of empire (1870–1914), legendary heroes and their astonishing deeds of conquest gave imperialism a recognizable human face. Henry Morton Stanley, Pierre Savorgnan de Brazza, Charles Gordon, Jean-Baptiste Marchand, and Hubert Lyautey all braved almost unimaginable dangers among “savage” people for their nation’s greater good. This vastly readable book, the first comparative history of colonial heroes in Britain and France, shows via unforgettable portraits the shift from public veneration of the peaceful conqueror to unbridled passion for the vanquishing hero. 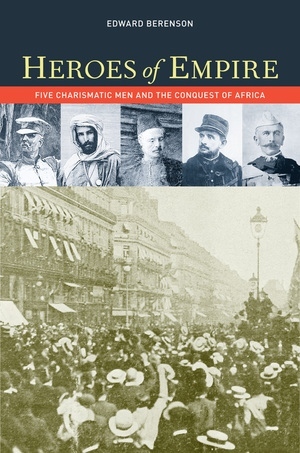 Edward Berenson argues that these five men transformed the imperial steeplechase of those years into a powerful “heroic moment.” He breaks new ground by linking the era’s “new imperialism” to its “new journalism”—the penny press—which furnished the public with larger-than-life figures who then embodied each nation’s imperial hopes and anxieties. Edward Berenson is Professor of History and Director of the Institute of French Studies at New York University. He is the author of Populist Religion and Left-Wing Politics in France and The Trial of Madame Caillaux (UC Press).